There comes a time in everyone’s career when it’s time to move on to greener pastures, but how do we know when it’s the right time to start looking? After all, we’ve all had bad days. Ones where we come storming in from a rough afternoon at work, declaring that we’ve had enough. Only to calm down later and put everything in perspective, reluctantly, we realize that we don’t want to leave our job. 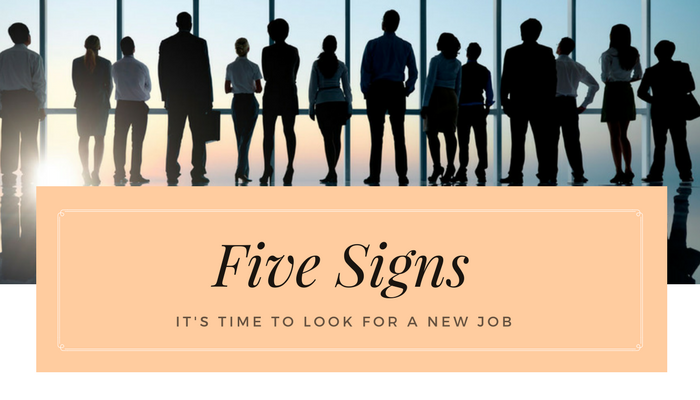 However, there are certain signs which indicate that it’s time for a change in our career. In order to do that, we need to understand what these signs are since they are not always apparent. Your days off should be a time to relax and enjoy life, away from the stresses of work life. If you find yourself spending all of your spare time worrying about work, then you’ve got a serious problem on your hands. Sure, it’s possible that you’re simply suffering a little anxiety about your upcoming sales figures. This is perfectly normal for even the most calm and collected characters. However, if you’re dreading the thought of going back through the office doors after a couple days off, then the warning signs are there. One of the most common questions you get asked when you meet someone new is: What do you do for a living? It’s times like these that you can really gauge how you feel deep down about your job. If your eyes light up at the opportunity to talk about it at length, then you know you should stay put. On the other hand, if your response only warrants a few words – some of which may be negative – then there’s a high chance that it’s not the right job for you. You have become stagnant in your career. We as humans thrive, when faced with a challenge. When we let those challenges fade, complacency starts to set in. The trouble with complacency, is that it fails to push us towards our full potential. Resulting in a job where you’ve mastered all the challenges it can throw at you. Mastering a job is a testament to your skills, but there comes a point where you have to seek out something new to keep your career progression on track. This is where a new job with a whole new set of challenges can come into play. Revitalizing your motivation for going into work. There are many different personality types. It’s more than likely you’re going to end up working with someone you just don’t connect with. When this person is your boss, it can have you seriously questioning why you’re going into work every day. Now, there will always be differences of opinions and clashes in any type of relationship, so you need to try and make the relationship with your boss work. However, if this still fails to manifest itself as a good working relationship, then it’s going to harm your career prospects. A new job offers the best chance of progression and sanity. One of the most common reasons to look for a new job is that you believe you can do better and achieve more. You may think that it sounds arrogant, but that little voice in your head is telling you to go for that promotion or that bigger job. That voice is your ambition. Achieving this ambition can be stalled if you stay in the same job for too long. Before you know it, you’ve been in the same job for 10 years, watching all your peers move onto bigger and better things. So, when you get that feeling that it’s time to move in a new direction, seize the day and start looking for that career advancement immediately.